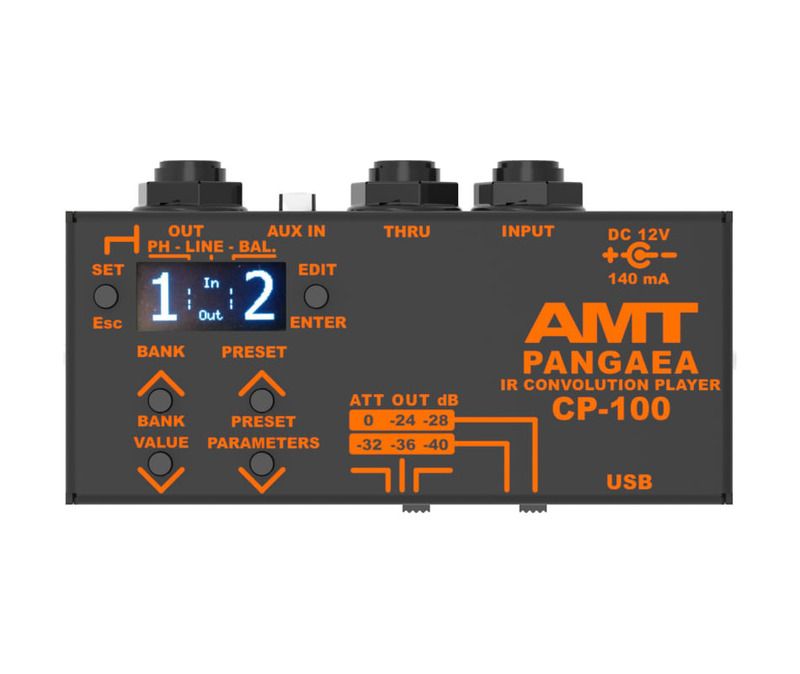 AMT Electronics is proud to introduce the CP-100 Pangea guitar cabinet impulse convolution player. As many guitarists out there know, technology in guitar processing has grown in leaps and bounds over the recent years. With the introduction of "cabinet impulse" files that can be found all over the internet, guitarists can download these files and use them with their computer to recreate perfect dead-on cabinet emulation. At AMT they wanted to make it easier for everyone to take advantage of this new technology, by offering a cabinet convolution player in a small compact portable pedal sized enclosure. Now, guitarists can use the Pangea wherever they wish; in the studio, playing live gigs, on their pedalboards, for late night practice sessions, etc. Take it anywhere. Finally, no more computers needed to implement cabinet impulses into your guitar rig!